Harrisonburg City Public Schools has become a leader in the state of Virginia for its approach to dual language learner education, says a new report from New America’s Dual Language Learners National Work Group. Since 2000, the number of DLLs enrolled in U.S. schools has grown by 18 percent, but these students are popping up in unexpected places. Six of the top ten fastest growing states for dual language learners (DLLs) are below the Mason-Dixon line: Alabama, Kentucky, Mississippi, North Carolina, South Carolina, and Virginia. 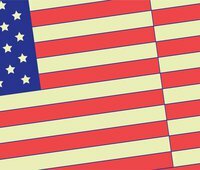 As these states grapple with how to best serve these students, they can look to local districts with a longer history of educating DLLs for lessons and replicable practices. Harrisonburg, Virginia, a community nestled in the fertile hills of the Shenandoah Valley, is emblematic of these sharp demographic changes. The town’s agricultural industry has attracted a large number of immigrant workers from Central America, and Harrisonburg’s refugee resettlement center has drawn many other international families to the area. Public school enrollment numbers reflect the influx of newcomers: in the past two decades, the number of DLLs in Harrisonburg grew from 10 percent of all K–12 students to a high of 41 percent. These children represent 51 home languages and 46 different countries. 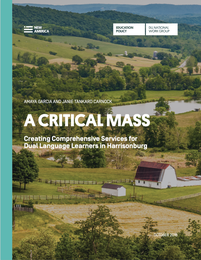 A Critical Mass: Creating Comprehensive Services for Dual Language Learners in Harrisonburg explores Harrisonburg City Public Schools comprehensive system of instructional programs, social-emotional supports, and family engagement strategies targeted to meet the needs of its DLL students. Furthermore, the district has made substantial investments to expand pre-K in order to provide children in the community with a strong foundation to get them ready for kindergarten and beyond. More than half of the children in these programs are DLLs, which speaks to the efforts made to ensure linguistically diverse families have access to information on enrollment and help with the enrollment process. Teachers are also provided with access to training and additional courses to help better prepare them to work with DLLs. “Leaders in Harrisonburg City have taken several steps that signal a real investment in their multilingual, multicultural students,” concludes Carnock, a program associate at New America. “Instead of rejecting change, the district has embraced it and innovated in response."